Are you into roasted squash? 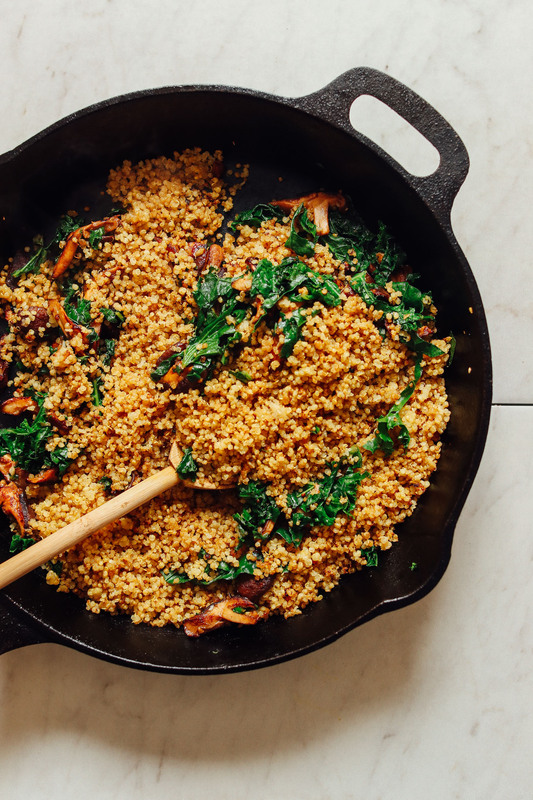 What about crispy quinoa, kale, and caramelized mushrooms? If so, I have just the dish for you! In addition to our new go-to Vegan Lentil Nut “Meatloaf,” I wanted to share another main dish for the holidays (and beyond). Plus, the ingredients happen to be some of my favorites this time of year, so it was just meant to be. Let me show you how easy it is! This dish requires just 10 ingredients and simple methods to prepare. 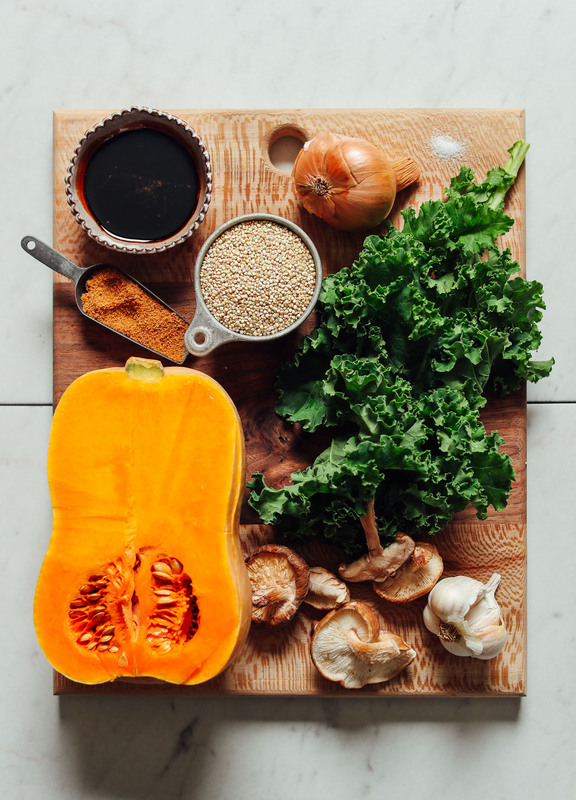 It starts by cooking your quinoa and roasting your squash until golden and tender. 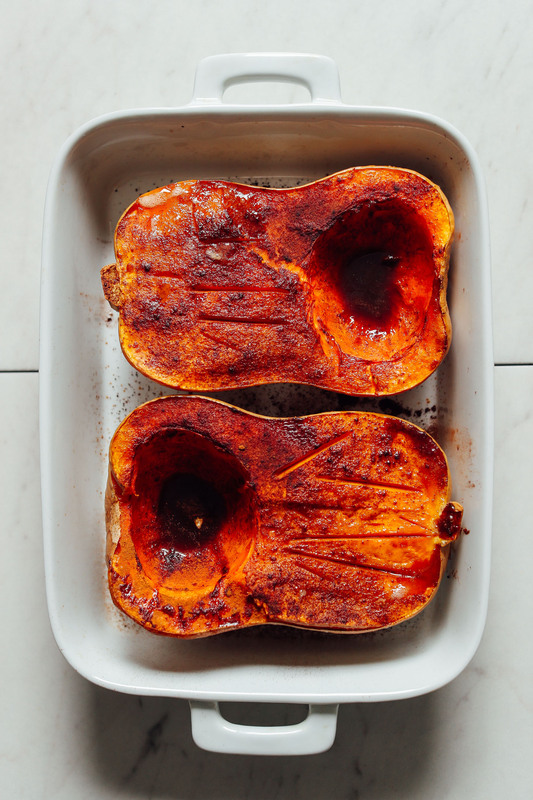 The squash gets a flavor boost from salt and a little coconut sugar. Next, you can prepare your balsamic reduction by simply cooking over low flame for 15 until a syrup forms. And all that’s left is sautéing your cooked quinoa, mushrooms, kale, and walnuts (optional). Once your squash is tender, stuff with your quinoa filling and bake another 5 minutes until hot. That’s it! For garnish we went with our balsamic reduction and our beloved crispy shallot to add a savory crunch to the top. It’s optional but highly recommended and can be prepared while your squash is roasting! & a delicious main or side! This would make the perfect entrée or side dish this holiday season, for friend and family gatherings, or a slow weekend treat. (Plus, it reheats beautifully making it perfect for leftovers!) While delicious on its own, we can’t help but want to pair it with our Vegan Garlic Mashed Cauliflower and Easy Vegan Gravy! Talk about the ultimate holiday feast. If you’re into squash, also be sure to check out our Roasted Squash Salad with Crispy Shallot and Balsamic Reduction, Curried Butternut Squash Soup, Cheesy Spaghetti Squash Pasta, and Saucy Butternut Squash & Portobello Tacos! 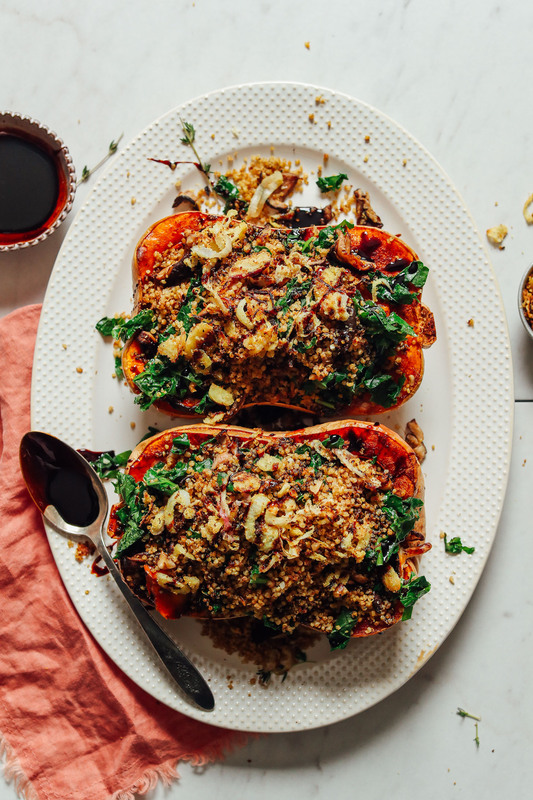 Roasted stuffed butternut squash makes the perfect plant-based entrée or side for the holiday season (and beyond). 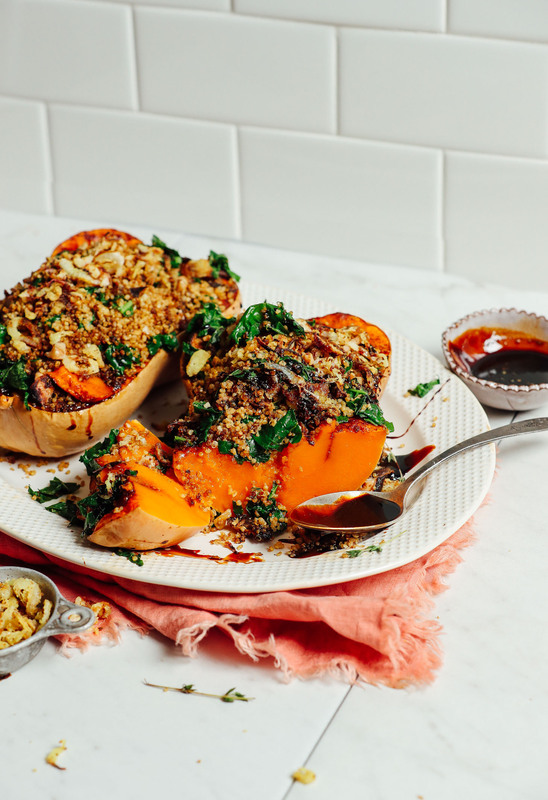 Stuffed with, quinoa, kale, and mushrooms; 10 ingredients required; and incredibly flavorful! Preheat oven to 400 degrees F (204 C) and set out a baking sheet with parchment paper or a silicon liner or grease a 9x13-inch (or similar size) baking dish. In the meantime, if you haven’t already done so, prepare quinoa by adding quinoa and water to medium saucepan and bringing to a boil over high heat. Once boiling, reduce heat to a low simmer, cover, and cook for 18-20 minutes, or until fluffy and the water is absorbed. Remove lid and let cool completely (uncovered) on the stovetop. Halve the squash lengthwise (tip and stem) by inserting your knife point into the squash and rocking toward the base. Then remove your knife, flip the squash around 180 degrees and insert the point into the same spot, but rock it toward the stem, pressing down firmly but carefully to split the squash in half. Scoop out seeds with a spoon or ice cream scoop. Then brush with oil (or water) and sprinkle with coconut sugar, cinnamon (optional), and salt. Place cut-side down on a lined baking sheet or baking pan. Bake squash for 15 minutes, then flip the squash over to cut-side up. Bake for another 30-45 minutes (sometimes more depending on the size of your squash), or until a knife easily pierces the squash (especially in thicker parts). It's better for the squash to be on the more tender side than firm, in our experience. In the meantime, prepare your balsamic reduction by adding balsamic vinegar to a small saucepan and bringing to a low boil over medium high heat. Once bubbling, reduce heat to a healthy simmer - about medium low heat - and cook for about 12-15 minutes. You’ll know it’s done when it’s reduced in volume by about half, it appears syrupy, and it has visible bubbles on the top. Set aside to cool. It will thicken as it cools. Once your quinoa is cooked and cooled, heat a large rimmed metal or cast iron skillet over medium heat. One hot, add oil or water and quinoa. Sauté for 5-8 minutes, stirring occasionally, until slightly crispy and browned. Season with half the coconut aminos for flavor. Then remove from skillet and set aside. To the still hot skillet add the mushrooms and the other half of the coconut aminos. Sauté for 2-3 minutes, or until browned and reduced in size. Then add garlic and kale and walnuts (optional) and sauté for another 1-2 minutes or until kale is just wilted. Then add quinoa back to the pan and toss to coat (see photo). Set aside. 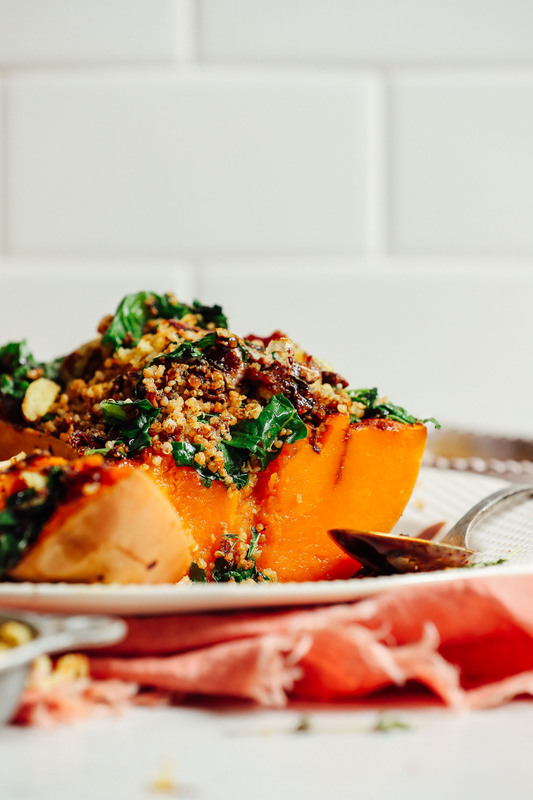 Once your squash is roasted, place cut-side up on the baking sheet or dish and fill to the brim with quinoa filling. Then place back in the oven to roast another 5 minutes. To serve, arrange on a serving platter or individual plates. We loved garnishing ours with some crispy pan-fried shallot*, parsley, and a drizzle of balsamic reduction. However, this would also pair well with a simple salad dressing like a vinaigrette, tahini dressing, or even Vegan Gravy. Store leftovers covered in the fridge up to 4-5 days. Reheat in a 350 degree F (176 C) until hot. *To prepare crispy shallot, add 2 sliced shallots to a small bowl with 3 Tbsp (30 g) brown rice flour, 1/8th tsp each salt and pepper, and toss to coat. Heat a medium (preferably cast-iron) skillet over medium heat. Once hot, add oil and floured shallots and sauté, stirring occasionally, until lightly golden brown and crispy - ~5 minutes. I will give this a 5-even though I have a lot of quibbles about it, b/c ultimately, it tasted good and was nutritious and is a dish I’ll probably make again, but with modifications. My first quibble is the 15 min. prep. time. No way! With all that washing, chopping, measuring, cooking ahead of time (quinoa), browning, etc., it took me a good hr at least of prep time. The other part that took longer was roasting the butternut squash, and mine was only medium sized, but it probably took an hour and a half to get it tender enough. Things I would change in future: I wouldn’t start roasting the squash cut side down. All the seasoning falls out. You have to turn in right side up in 15 min. and the sugar ends up burning. I had used just brown sugar & pats of butter instead of the more exotic oils and coconut sugar (I’m not strictly vegan), so I tried to scoop that back into the squash when I turned them around. It was a really good suggestion to bake them on parchment paper. Also, the sprinkling of cinnamon was a nice addition. I would make the quinoa the day before, b/c I couldn’t get mine cooled down in the time frame. Also, I’d skip the browning of the quinoa as well as of the shallots. These steps took a lot of extra time and weren’t worth it in terms of enhancing flavor. I think I’d just saute the sliced shallots with the mushrooms and kale, and add the cooked quinoa without the browning. Or, maybe brown the quinoa kernels a bit before boiling them for a little roast flavor? I didn’t have coconut aminos so I just used salt & pepper. When I tried reducing the balsamic vinegar, it didn’t get syrupy so I finally stopped when it had boiled long enough. It did add a nice flavor to the kale. I used regular white mushrooms and brown (what I had on hand), and more than the recipe called for; also with the kale. I had a small bunch, so I chopped it all (minus the toughest stems), and it was a lot more than what the recipe called for. But I think it all came out fine when I sauteed and mixed everything. All in all, a tasty, hearty, filling, and nutritious dish. Wow, this was incredible! I am never disappointed by the recipes I find on this blog! I followed the recipe closely only substituting coconut flour instead of brown rice flower for the crispy shallots and almond slices instead of walnuts. This recipe was , sweet with tartness and texture! I am definitely going to make this again but use baby bella mushrooms instead because they are my favorite and a little less costly! I can’t wait to try more, you guys have me eating like a queen! I made this for lunch today. I didn’t have butternut squash so I substituted acorn squash. Timing was the same. I should have used 2 as I had more quinoa stuffing than squash. I also cooked some sweet potatoes along side the squash. Very yummy. Everyone gobbled it down. Thanks Dana. We’ve made this twice now, and it is the most underwhelming MB recipe to-date, in our opinion. The entire dish lacks on flavor, and we have made it using both coconut aminos and tamari. I would suggest using tamari for more saltiness, and adding in your favorite spices. We added cayenne, cumin, and garlic powder to jazz it up. We love most of MB’s recipes, but will not be attempting this again. This was really delicious! The flavors came together beautifully, the squash was soft, and the filling was hearty and perfect for a cold night. Cooking the balsamic vinegar made my whole house smell wonderful. I only question how your recipe provides 8 servings. The squash I found at the store was on the smaller side so I bought 2 and roasted 4 halves. There was plenty of filling for all four but there was no way a house of hungry vegans was going to share their delicious half with anybody else! Thanks for an outstanding recipe! Thanks so much for sharing your experience, Monika! We are so glad you and your dear enjoyed it! I made it and my husband and I both loved it. I used spinach since I didn’t have kale on hand. Easy but looks like from an expensive restaurant. This was absolutely delicious. My husband and I ate it for two dinners and a lunch. The reduced balsamic vinegar was delicious drizzled on the top. On the “stuffing” part, I filled the seed cavity in the squash halves and then just piled the stuffing on the top. It worked well and looked beautiful. It heated up beautifully for leftovers, in the oven. As others have said, this recipe took much longer to make than the time suggested on the recipe. I made this last night. The directions were awesome! The meal was delicious! I will make this again and again. What I loved about this recipe was that it flowed beautifully. It all came together while the squash was roasting. I have loved each recipe of yours that I have tried. Thank you!! We’re so glad you enjoyed the recipe, Lucy! That seems like a very small portion if one squash is supposed to serve 8 people. It is just so dang cute! I think it s important to have a gorgeous centerpiece for your holiday feast, whether it be Thanksgiving, Christmas, or any other time you want to celebrate with loved ones. 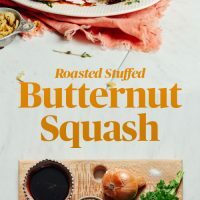 With this stuffed roasted butternut squash you get all of the wow factor a good feast deserves. I’m eating this as I type. My hats off to the genius who concocted this in the kitchen! 5 stars as always! Hello! It looks great and I am planning on making it for my Christmas party. I have a question. Where I live, I cannot get the coconut sugar, coconut aminos, or tamari (too late to order :-)…). What else can I use? Thank you!! Sub brown sugar and soy sauce! Can I make this with a red kuri squash instead? I made this Sunday night for myself and had leftovers for the next 3 nights. 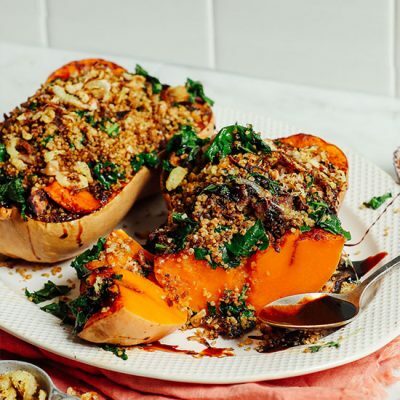 Delicious and easy with great flavors, and it reheated well in my toaster oven in 20 minutes on 350 which crisped up the kale and quinoa without burning them. I plan to make it again soon with sweet potatoes. A keeper! Forgot to mention that I used cremini mushrooms and they were still delicious. Hi! This look amazing! I would love to make soon, but I noticed there are a couple measurements recorded without ingredients.. what are these missing pieces? We really enjoyed it, thanks for the recipe. Oh my gosh! This is delicious! I made a double batch so I could eat one tonight and take one to my office holiday party tomorrow! They’re gonna love it. OHHH my goodness! I absolutely loved this meal! It was very easy to make as far as involving simple ingredients and steps. I am in the middle of finals week and the was the best meal to help nourish me for the rest of finals week! I enjoyed all the flavors and how they came together! This looks delicious! I’ll be trying this over xmas as a healthy ‘down time’ recipe! In the recipe it doesn’t list cinnamon but in the directions you say to add cinnamon to the squash. I just sprinkled it but I was wondering if you had an exact measurement. Will amend – good catch! This looks fabulous and I have over a dozen butternuts from my summer garden, BUT, sadly, I don’t like mushrooms. What would you use instead? I love kale and quinoa and nuts…. Any suggestions would be very much appreciated. You can easily omit them, or sub another vegetable you like such as bell peppers or Brussels Sprouts! First question: will this serve 8 as the main course? I’m thinking 4. Also, my prep is at least double your lusted time, sometimes up to four times longer! Do you assume everything is prepped and pre-measured before starting? I never thought I was that slow! Hi Sally! I would definitely recommend doubling the recipe (at least) if you want to serve it as the main course for 8 people. Cooking times will vary from person to person but we are measuring from prepped ingredients to serving. Hope this helps! Thanks for your response. The cook times were about the same, but working away it took me almost 3 hours including chopping, measuring, cleaning foods, coring, etc. The final result was a very late but delicious, rich, filling, attractive dinner. Thank you. Just cut the squash open and it has the smallest seed pockets and there’s barely any room for stuffing. What would you recommend I do? Use a spoon and carve out a larger pocket! I made this last night for a dinner with friends, and not only did it look great, but it tasted delicious too! Everyone enjoyed it. A wonderful savory comfort dish with a hint of sweetness. Can easily be served as a main, or cut into slices and served as a side. I’ll definitely be making this again! Forgot to rate! 5 stars of course! Made this tonight. Really yummy!! I am not a fan of mushrooms but would love to try this dish. What could I substitute for the mushrooms? Hi Jamie! You can easily omit them, or sub another vegetable you like such as bell peppers or Brussels Sprouts! love your recipes, I usually tweak then a bit,some times they are to large for two, if I don’t have the ingredient I’ll skip it, over all they are very delicious, thank you for sharing. I am going to make this but with couscous…quinoa, I just can’t do it…those weird little creepy dots…haha but honestly this is absolutely gorgeous!! I use so many of your recipe ideas…this is my go-to blog for beautiful food…thank you! Hi! Thanks for your wonderful recipes. I have teo questions. Can we substitute another flour for the rice flour? Because of the Arsenic levels in rice, i’m trying to avoid it as much as possible. Also, although it’s not related to this recipe, but for the same reason – what would you substitute for Brown Rice Syrup in recipes? For brown rice syrup I’d sub maple syrup or agave. And for rice flour try a gluten-free blend without rice! This recipe looks really good. I’ve never stuffed a butternut squash before. I will have to try this! Do you eat the skin of the squash? Yep! But if you’d rather not, you can leave it behind when eating. I would only eat the skin if it’s organic, myself.